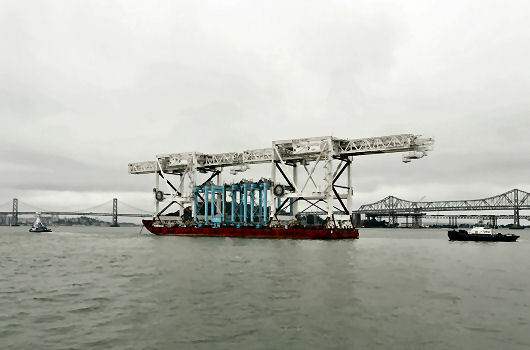 No longer needed in Oakland, 2 low-profile Kocks container cranes plus 4 rubber tire gantry cranes (RTGs) were relocated from there to the Conley Container Terminal in South Boston in late summer of 2010. Argonautics Marine Engineering, Inc. assisted with the design of the seabracings for the cranes and RTGs, using detailed FE models. 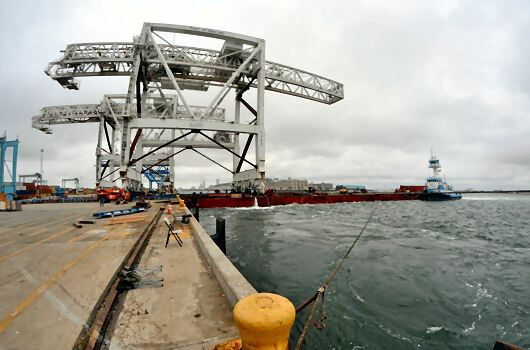 The cranes, weighing approximately 1,100 t each, were loaded onto the 402 x 100 ft cargo barge CHICAGO BRIDGE using 4 skid tracks and 8 skid shoes. 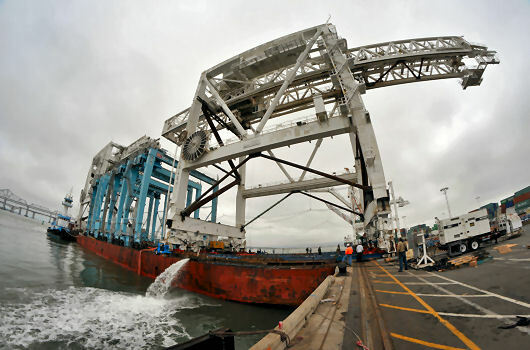 The RTGs were rolled on board over the stern, immediately after loading of the first crane. After loading, the cranes and RTGs were secured with pipe bracings. Loose items and skid equipment were secured with welded clips and/or chain lashings. On August 2, upon receipt of the tow approval certificate, the tug and barge departed Oakland, with destination Boston, via Panama Canal. After successfully avoiding some tropical storms and hurricanes, the tow safely arrived in South Boston on September 11. 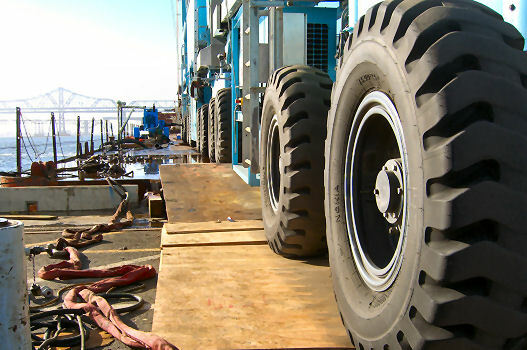 A few days later, the RTGs were rolled off onto the dock over the barge side. Days later, in between cruise ships arrivals and departures at the opposite berth, and while dealing with a 10 ft tide range, the cranes were successfully offloaded and lowered onto their new rails, ready for many more years of operation under the flight path for Logan International airport. Attend the offloading operations in South Boston.